For the first time, researchers used benzene – a common hydrocarbon – to create a novel kind of molecular nanotube, which could lead to new nanocarbon-based semiconductor applications. Researchers from the Department of Chemistry have been hard at work in their recently renovated lab in the University of Tokyo’s Graduate School of Science. The pristine environment and smart layout affords them ample opportunities for exciting experiments. Professor Hiroyuki Isobe and colleagues share an appreciation for “beautiful” molecular structures and created something that is not only beautiful but is also a first for chemistry. Their phenine nanotube (pNT) is beautiful to see for its pleasing symmetry and simplicity, which is a stark contrast to its complex means of coming into being. Chemical synthesis of nanotubes is notoriously difficult and challenging, even more so if you wish to delicately control the structures in question to provide unique properties and functions. Typical carbon nanotubes are famous for their perfect graphite structures without defects, but they vary widely in length and diameter. Isobe and his team wanted a single type of nanotube, a novel form with controlled defects within its nanometer-sized cylindrical structure allowing for additional molecules to add properties and functions. The researchers’ novel process of synthesis starts with benzene, a hexagonal ring of six carbon atoms. They use reactions to combine six of these benzenes to make a larger hexagonal ring called a cyclo-meta-phenylene (CMP). Platinum atoms are then used which allow four CMPs to form an open-ended cube. When the platinum is removed, the cube springs into a thick circle and this is furnished with bridging molecules on both ends enabling the tube shape. It sounds complicated, but amazingly, this complex process successfully bonds the benzenes in the right way over 90 percent of the time. The key also lies in the symmetry of the molecule, which simplifies the process to assemble as many as 40 benzenes. These benzenes, also called phenines, are used as panels to form the nanometer-sized cylinder. 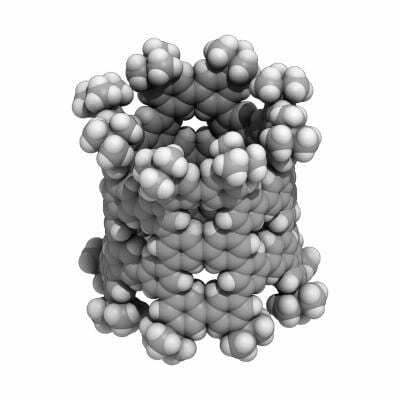 The result is a novel nanotube structure with intentional periodic defects. Theoretical investigations show these defects imbue the nanotube with semiconductor characters.